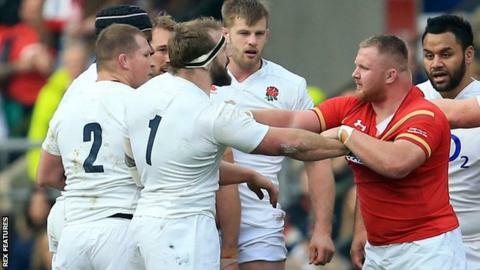 England's Joe Marler (1) is confronted by Samson Lee, who later said he accepted the comment was "banter"
England's Joe Marler will face a World Rugby misconduct hearing on 5 April for calling Wales' Samson Lee "Gypsy boy". Six Nations organisers had ruled Marler would not be punished for the comment, made during the first half of England's 25-21 win over Wales on 12 March. But World Rugby, which governs the international game, says the prop's remark "amounts to misconduct and/or a breach" of its code of conduct. Marler apologised to Lee, who is from the Traveller community, at half-time. The Harlequins player was reprimanded by England head coach Eddie Jones, but the Welsh Rugby Union was disappointed he was not suspended.